New WWA Range datasheet ! 1070 ECO obtained ECOBOARD certification! 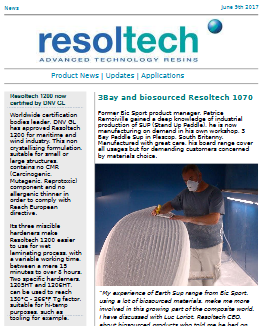 Pioneer in the market of biobased epoxy resins, Resotech is proud to annonce that biobased lamination resin 1070 ECO just obtained level one certification from the Eco Board Project! After several months of testing, Resoltech’s R&D team is now glad to annonce that the change of formula will now be applied to our clear flooring epoxy sytem : Liquid Resin Art ! For the past 20 years, the WWA epoxy resin system has been a reference and a premium choice for clear castings thanks to its low refraction index, clarity, excellent degassing properties and low exotherm . Like all thermosetting resins though, a slow yellowing of the resin could be observed upon ageing, and outside use was not recommended due to poor UV stability.